Each of these saints have their own feast day: St. 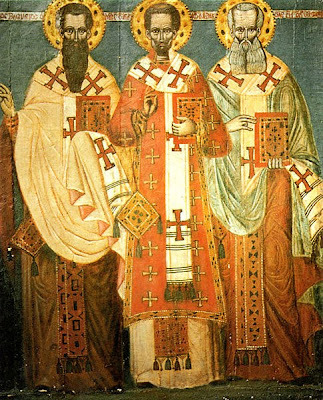 Basil the Great, January 1; St. Gregory the Theologian, January 25; and St. John Chrysostom, January 27. 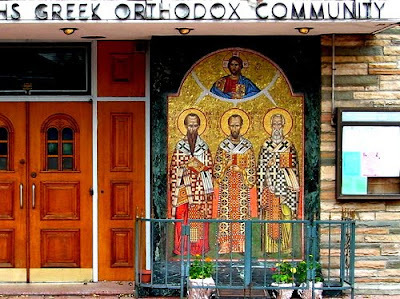 This combined feast day, January 30, was instituted in the eleventh century during the reign of Emperor Alexios Komnenos. At one time a debate arose among the people concerning who of the three is the greatest? 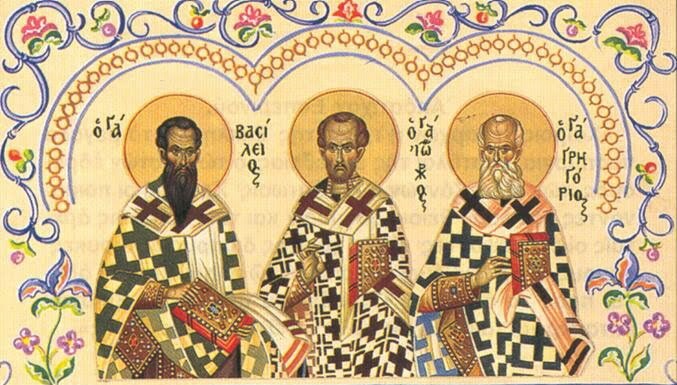 Some extolled Basil because of his purity and courage; others extolled Gregory for his unequaled depth and lofty mind in theology; still others extolled Chrysostom because of his eloquence and clarity in expounding the Faith. Thus some were called Basilians, others Gregorians, and the third were called Johannites. This debate was settled by Divine Providence to the benefit of the Church and to an even greater glory of the three saints. 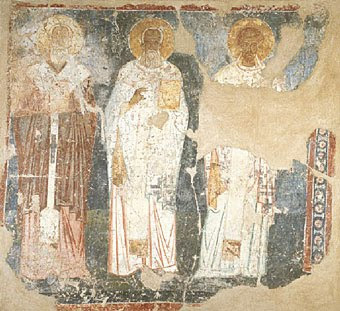 Bishop John of Euchaita (June 14) had a vision in a dream: At first, all three of these saints appeared to him separately in great glory and indescribable beauty, and after that all three appeared together. They said to him, "As you see, we are one in God and there is nothing contradictory in us; neither is there a first or a second among us." The saints also advised Bishop John that he write a common service for them and to order a common feast day of celebration. Following this wonderful vision, the debate was settled in this manner: January 30 would be designated as the common feast of these Three Hierarchs. The Greeks consider this feast not only an ecclesiastical feast but their greatest national school holiday. Golden mouths, mouths of honey! No one is the main one, no one is secondary. You glorify one, all three rejoice. The three greatest beacons of the Three-sunned Godhead, who lighted the whole inhabited world with the beams of their divine doctrines, the rivers of wisdom flowing with honey, who watered all creation with streams of the knowledge of God, Basil the Great and Gregory the Theologian with famous John whose tongue spoke golden words, let all we lovers of their words now assembled honour them in hymns. For they ever intercede with the Trinity on our behalf. You have taken, Lord, the sacred, the God-inspired heralds, the high peak of your Teachers, for the enjoyment of your good things and for repose; for you accepted above every offering their toils and their death, you who alone glorify your Saints.